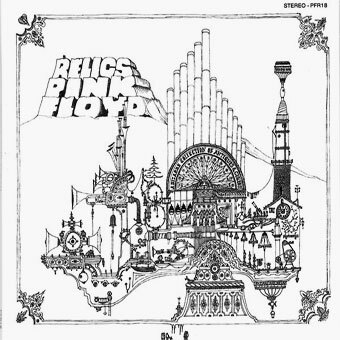 Relics (subtitle: A Bizarre Collection of Antiques & Curios) is a compilation album by Pink Floyd, combining early singles, B-sides, album tracks and one unreleased number, "Biding My Time", combining early singles, B-sides, album tracks and one unreleased number, "Biding My Time". The album was released in the UK on 14 May 1971. TRACK LISTING: Side one : 1. "Arnold Layne" (Single A-side released 11 March 1967) - 2. "Interstellar Overdrive" (from The Piper at the Gates of Dawn 1967) - 3. "See Emily Play" (Single A-side released 17 June 1967) - 4. "Remember a Day" (from A Saucerful of Secrets 1968) - 5. "Paint Box" (Single B-side to "Apples and Oranges", released 18 November 1967) - Side two : 6. "Julia Dream" (Single B-side to "It Would Be So Nice", released 13 April 1968) - 7. "Careful with That Axe, Eugene" (Single B-side to "Point Me at the Sky", released 7 December 1968) - 8. "Cirrus Minor" (from Soundtrack from the Film More 1969) - 9. "The Nile Song" (from Soundtrack from the Film More 1969) - 10. "Biding My Time" (Previously unreleased, 1971) - 11. "Bike" (from The Piper at the Gates of Dawn 1967). Official vinyl reissue on 180gr vinyl, remastered from the original master tapes.